Everybody of a certain age has some kind of 9/11 story to tell. Mine isn’t especially interesting, but unlike most people, I was on my way to the World Trade Center that morning. It was my usual route to work: a commuter train to Hoboken, a PATH train under the Hudson River to the Trade Center, followed by a subway to Brooklyn. On our way to Hoboken, the conductor announced that a plane had flown into one of the towers, resulting in the train station under the Trade Center being temporarily closed. I assumed it was some disgruntled, suicidal guy in a Cessna. Since I needed to get to work, I took a PATH train to Greenwich Village, a couple miles north of my original destination. Up on the street, walking to the subway, I could see one of the towers burning. 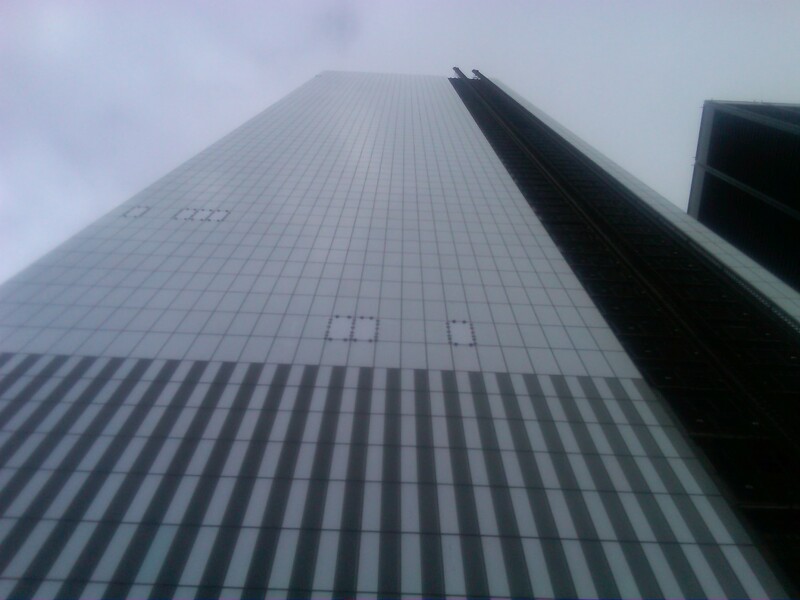 By the time I got to work in Brooklyn, the second tower had been attacked. We could see the smoke from the upper floors of our building, but I wasn’t watching when the towers fell. The stock exchange closed that week, but we back office people still had work to do, mainly preparing for the exchange to open again. I read the paper as the days went by, but didn’t watch much television. I avoided the TV news coverage. I didn’t watch the same videos over and over again, or see the Mayor or the President visit the site. 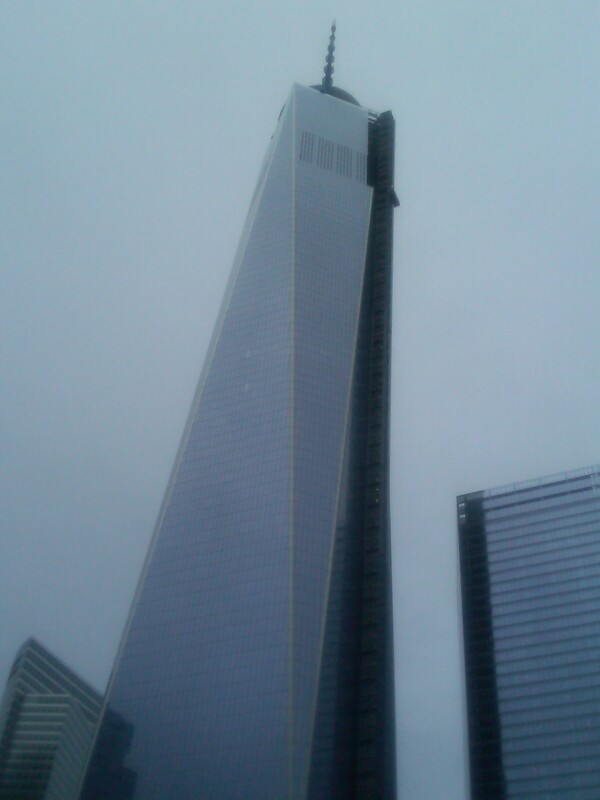 A week or so later, I had to visit Lower Manhattan for a meeting. What I remember most walking through those gray, relatively empty streets was the terrible, acrid smell. It seemed like the air had been poisoned. Yesterday, 12 years later, I happened to be in the Wall Street area with some time on my hands, so I decided to visit the 9/11 memorial, not knowing how much of it has been completed. You can print out a free ticket from the memorial’s website, which allows you to get inside the memorial more quickly. But even on a cool, cloudy October weekday, there were hundreds of people with tickets waiting in line. And, of course, there was a security checkpoint, with the standard grey plastic tray for your wallet, keys, phone and belt. When you finally get inside, you’re in a kind of park, in the large space between the new buildings. 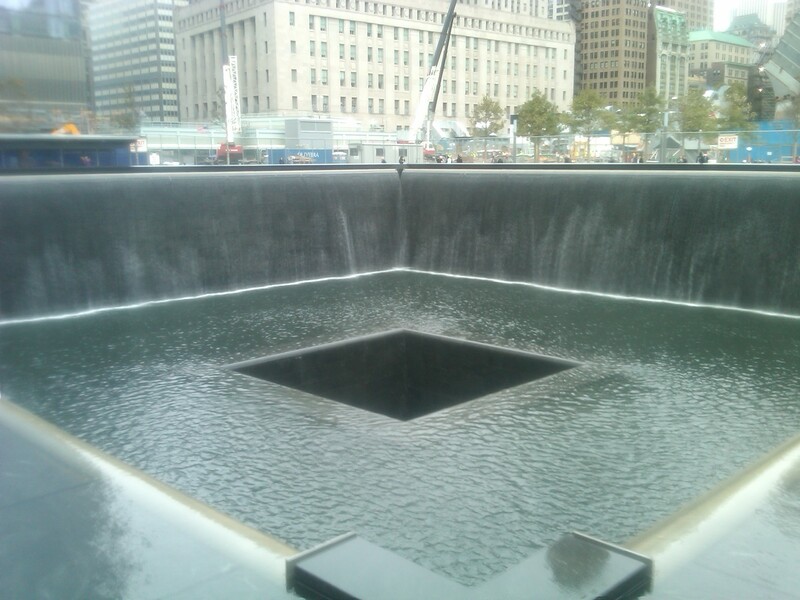 You hear the water falling down the sides of the enormous fountain that marks the outline of the South Tower. The visitors are crowded along the nearest sides of the fountain, looking over the edge, taking pictures and reading the names inscribed in the black marble. 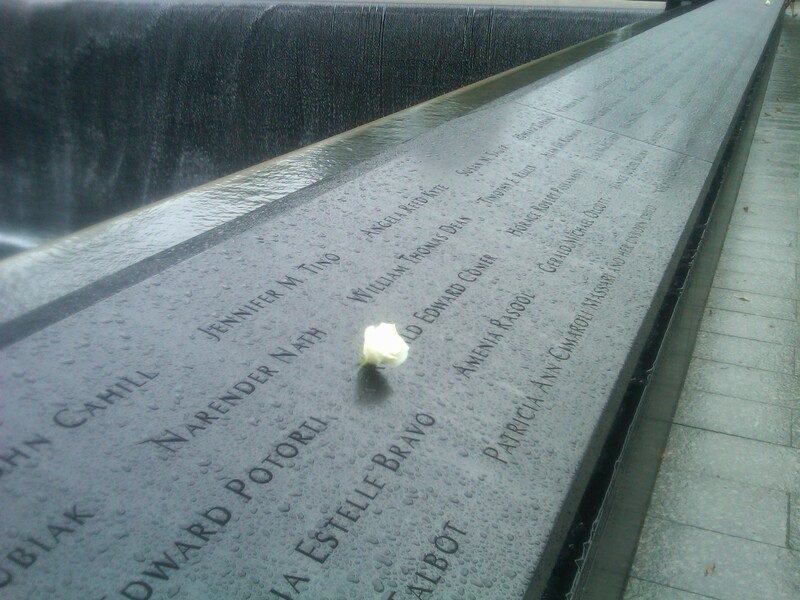 To get away from the crowd, you can walk around the fountain, stopping to read some of the names, which I did. 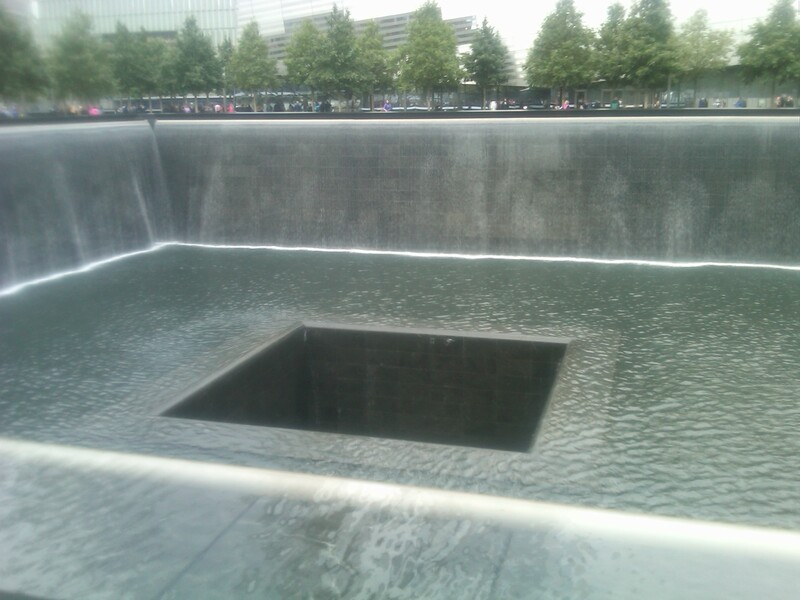 On my way to the exit I noticed the fountain that marks the outline of the North Tower. Hardly anyone was there. I suppose if you’ve seen one enormous black fountain with thousands of gallons of water plunging down it sides into an apparently bottomless pit, you’ve seen them all. After walking around the second fountain, I headed for the exit again. People say the site is sacred. I thought it was sad. And human. There are lots of visitors, the regular people you see at other tourist attractions: a lot of miscellaneous, casually-dressed people taking pictures of the place and each other, some being a little loud, some being led around by tour guides, most of them crowded together where a fountain is closest to the entrance. Some of them have bought souvenirs at the stores in the neighborhood that sell trinkets and t-shirts. I suppose it’s all a reminder that those were regular people killed 12 years ago, in fact, the same kind of people you’ll see if you visit the memorial. Of course, some of those regular people were heroes that morning. For the most part, however, they were average men and women, a mixture of colleagues and strangers with a variety of names, all kinds of names reflecting the many places their ancestors came from. At least as impressive as all that water rushing down, the scale of the place, and the tall buildings around it, are all those names.